I am in love with this class. 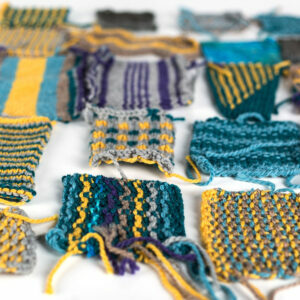 It was tons of fun to swatch colorwork patterns that use only one color at a time. We start with basic stripes, and then mix it up with slipped stitches, mosaic stitch and linen stitch. I pulled out favorite garments knit over the years for examples, and knit a few new ones, too. Even after coming home, I found myself still wanting to play with stripes. I just finished this dress, which is a slipstitch pattern using 2 colorways of Noro, in stripes! I loved prepping for the class. Filming it was great, too. Now I get to interact with students who take it, and I am looking forward to that. I love Craftsy! 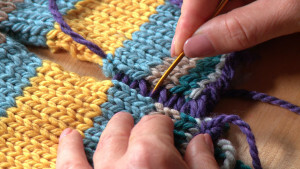 Enter a drawing to be enrolled in “Simply Stunning Colorwork”, free of charge. Click HERE to be entered automatically, whether you have a Craftsy account already, or not. There is one entry per person, and the name will be drawn the night before launch (Monday, Jan. 5th). The winner will be notified on launch day, and I will announce it here, too. Good luck!!!!! Love the idea for the class. BTW , contest link gets lost.